Experience Bavaria & Beyond on one of our 2018 tour packages! Come experience the world-famous Oktoberfest celebrations! Learn about the history of this special event and get a tour of the grounds before heading into one of the tents. There, the group will have private tables (lunch and beers included) to take in the atmosphere. Destinations: Garmisch-Partenkirchen, The World Famous Oktoberfest. Tour Includes: 4-Star Accommodations in Garmisch-Partenkirchen. Free Wi-Fi, daily breakfast breakfast buffet, guided day Tours, private table at Oktoberfest with lunch and beers included, Welcome Dinner Reception, daily themed gifts, custom 'Aufwiedersehen' highlight film. Highlights: Lakefront accommodations on Lake Garda, Karwendel mountain Cable Car ride, visit to Church Tower of Lake Resia, Venice Excursion, Verona's Roman Amphitheater, the Romeo & Juliette house, private Italian wine seminar in the scenic countryside, Franzenfeste WWI Fortress. Discover Bavaria during the most magical time of the year! The festive markets and romantic destinations visited on this tour are sure to put guests in the holiday spirit. Immerse your senses in the wonderful aromas, sounds and sights of the region's renowned Christmas Markets. Peruse the unique stalls as the scent of almonds roasting and the sound of horse bells ringing fill the air. Whether experiencing these festive markets for the first time or returning as an annual tradition, all guests are sure to head home with hearts full of Christmas cheer! Tour Includes: 9 night stay at the 4-Star Rheinischer Hof in Garmisch-Partenkirchen, free Wi-Fi, daily breakfast buffet, 7 guided day trips with city tours & excursions, Welcome & Farewell Dinner Receptions, daily themed gifts, custom 'Aufwiedersehen' highlight film. The beauty and wonder of the Alps becomes even more magical when the festive holiday season arrives. Experience the wonder as town squares overflow with holiday cheer, carols and lights during local Christmas markets. Discover authentic Christmas traditions as we make our way to markets in Germany, Switzerland, France, Lichtenstein, and Austria. With old favorites and exciting new destinations, this years Bavaria & Beyond Alpine Christmas Market Tour is sure to be unforgettable! Highlights: Christmas Markets in 5 countries, Black Forest Coo-Coo Clock Maker, 5-Star Lake-Front Accommodations in Lindau. €100 off your next Bavaria & Beyond vacation! 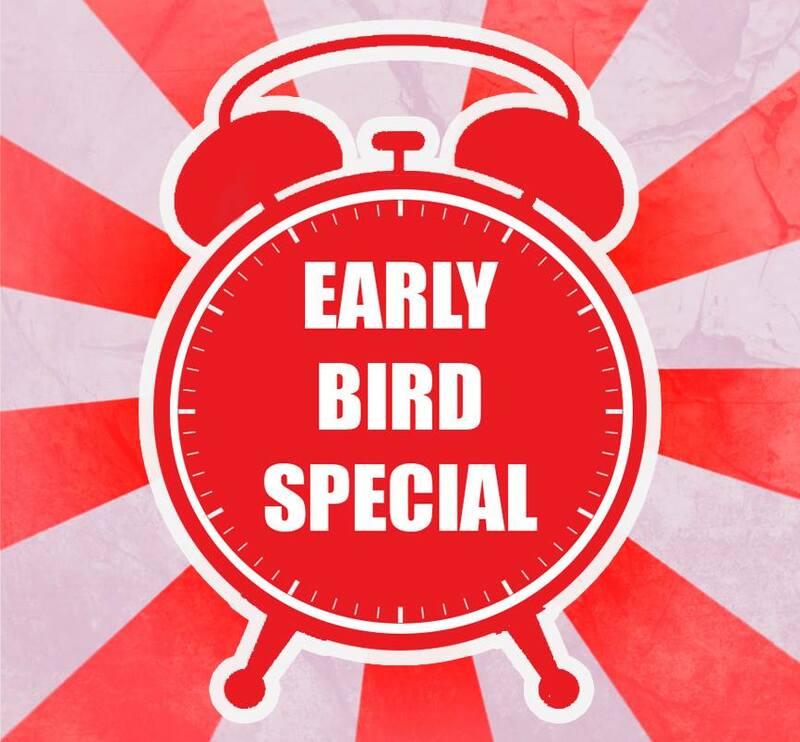 The first 10 room reservations on each tour package qualify for our Early Bird rate and receive an additional €100 off their reservation deposit! If the icon appears on the tour package photo the discount is still available. Book now and don't miss out! If you would like to share our upcoming tour packages with friends, family, and/or community groups; please feel free to print out our promotional flyers below. We thank you in advance for supporting the growth of Bavaria & Beyond Tours!